The death of a brilliant artist summons the investigators to Leningrad, setting them in pursuit of a mystery older than Russia herself. But when each secret revealed brings the investigators closer to madness, is the truth worth the price? 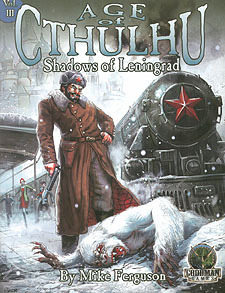 The trail of clues takes them from the dachas of the Orkonov Estate to the Revolution Hospital and State Museum of Leningrad, and finally to the wilds of the frozen forests, where the investigators are faced with a terrifying puzzle unlike any other. Set throughout the globe and torn from the pages of the hidden history of the world, Age of Cthulhu adventures bring new secrets and mind-bending horrors to your 1920s, Call of Cthulhu games. Each adventure comes with copious player handouts, detailed maps, and pre-generated investigators ready to risk their lives and their sanity to confront the terrors of an uncaring universe. Age of Cthulhu adventures include many of the classic elements of Call of Cthulhu action, investigation, and a forbidding sense of horror. Though the adventures utilize real locations and historical events, Age of Cthulhu is first and foremost dedicated to exploring the horrors of the Cthulhu Mythos, and to bringing the excitement of heroic pulp-themed adventure to your gaming table.